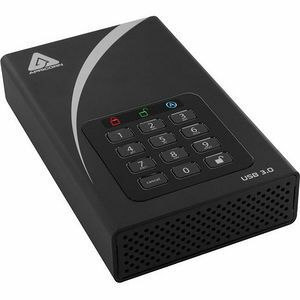 Featuring 256-bit hardware encryption, the Aegis Padlock DT seamlessly encrypts all data on the drive in real-time, keeping your data safe even if the hard drive is removed from its enclosure. With no software installation required for setup or operation and the ability to run on any platform, the Aegis Padlock DT provides stress free deployment in corporate environments. The Aegis Padlock DT can be configured with independent Admin and User PINs. The Administrator Feature allows enrollment of up to five unique User ID's and one Administrator. If the User forgets their PIN, the drive can be unlocked using the Admin PIN. The unattended Aegis Padlock DT can be configured to lock after a pre-determined amount of time of your choosing. Ideal for protecting your data when you're away from your desk. Compatible with most standard security locks, the Aegis Padlock DT's lock slot enables the drive to be secured to your desk or other permanent fixture for an added layer of physical security. The Aegis Padlock DT uses a three-pronged approach to protect against a Brute Force attack. The first step is to deny access to the drive until the drive can verify the user PIN. After several incorrect attempts the drive will lock itself, requiring the drive to be plugged in again to input a PIN. This feature blocks automated attempts to enter PIN numbers. Lastly, after a predetermined number of failed PIN entries, the Padlock DT assumes it is being attacked and will destroy the encryption key and lock itself, rendering the data useless and requiring a total reset to redeploy the Aegis Padlock DT.